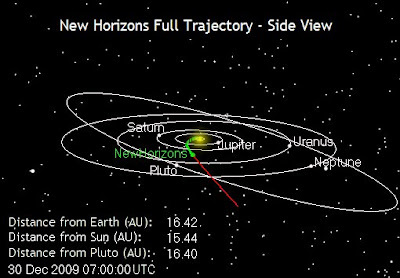 New Horizons is exciting in a Voyager-style discovery sort of sense, as we haven't launched a probe out to such a distance since 1977, but Dawn is in my opinion a more exciting mission, as it will not only be arriving at both Vesta and Ceres before New Horizons makes its way to Pluto (July 2011 and February 2015), but these two destinations are completely new and also close enough to Earth that they may be good locations for human colonization. Actually, 24 Themis might be even better (also here en français). Given the recent discovery of the creation of water on the Moon and the fact that there is no reason the same process shouldn't occur on asteroids as well, the more we know about these locations the better. Dawn's location can be seen here. 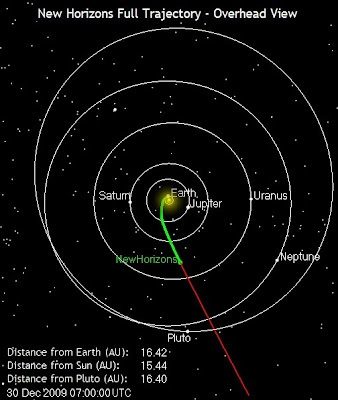 At the moment it's still circling the Sun at a position quite close to Mars, but is just about ready to break away and make its way towards Vesta. Since the approach to Vesta is so slow the mission overview also notes that optical navigation will begin 3 months before arrival, with more and more accurate images leading to a more precise approach, and hopefully around then (one year from now) we will see some published images as well.